Since the intention of 360 feedback is to find out what the groups of people you work with think, it must be clear that the feedback has to be kept separate. Systems that mix the feedback together and give an 'average' are less than useful. One manager may relate really well with his/her team but at the cost of poor relationships with peers. Another may be just the opposite. Their average 'scores' might well be the same! And how much should the manager's manager count compared to a critical staff member or peer? No, best practice says that whatever else you do, you must keep different categories of feedback separate - that's why you're doing 360! This is standard practice throughout the suite of 360 Facilitated® profiles. Maybe not everyone in Australia will be thinking climate change when they vote tomorrow, Saturday 24 November but a surprising number will be. For the first time since the damming of the Franklin River, the environment is a factor in an election here. With each election it becomes a bigger factor and one day (tomorrow?) it will play a crucial role. Meanwhile, in the UK, Prime Minister Gordon Brown has stated his determination to make Britain a world leader in the new "technological revolution" required to beat global warming. Australia, once the world leader in solar technologies (in the 1950s), better equipped than any other nation to develop and use solar, is bypassed (cold sunless Sweden does much more!). Tomorrow is our chance to wake up, lets see what happens! It will be, perhaps, one more step. Judgements about managers are not always so helpful. There is a belief that if you know the competencies a manager needs for the job and you can put a number on each of the components, then you will know the manager. Not that simple. Competencies operate in contexts. Perceptions are also affected by the context - what's going on. People rate based on how they feel right at this moment. That's affected by maturity, culture, fluctuating work loads. And, of course, the manager's reaction to being rated can be defensive, angry, even vengeful. The best feedback avoids all that. It says only: what do you need from the manager to do your job better? That is the first step in a dialogue that leads them to work together at their best. It points the finger at the task, not the manager. Does that mean the manager doesn't change? Of course not! The experience changes the manager - and the team. There is maturing and high performance all round. This is central to the approach of 360 Facilitated®. It has a great track record, with many happy managers around the globe. 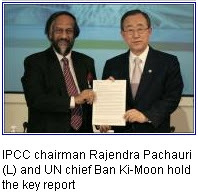 The IPCC's latest report is warning us that "the impact of global warming could be 'abrupt or irreversible' and no country would be spared". They also agreed that human causation is "90% likely". In other words, we're doing it and we had better stop fast. Apply that to carbon emissions (we used to call it pollution) and it's not hard to imagine a situation similar to the way some cities deal with smog - odd cars on Mon, Weds, Fri, even cars on Tues, Thurs, Sat - this is just to let people keep breathing. We will have to do something drastic to help those more at risk to stay alive - and that could be us. The combination of human will plus human inventiveness can bring change fast - but only if we have politicians who can a see a little beyond their own noses (or re-election). We haven't had a lot of that in the past. We also have the power of business which will find ways to make profits out of the transformation, but need that political push to get them out of their purely competitive mode into a more collaborative mode. They may want to try their hand at Sustainability Planning - Mega Planning. For once, this is a real case of "an opportunity not to be missed". If you do miss it, you may be out of business. If you take it, you will find your way into the future. Let's see where we go next. LOHAS - start looking for Green! If you're the ethical consumer - and there are more every day, you can start looking for the Lifestyles Of Health And Sustainability - LOHAS - stamp of approval that indicates you have found the real thing. The more you do it, the more business and industry get the wake-up call. Those businesses that won't hear the call and make their contribution will suddenly find that they have been left behind. You're not alone! There are already 8% doing values based shopping - not much, eh? No, but there are 41% on the learning curve and gradually picking up on what's available. So keep it up - or start, whichever! And spread the word. We are the ones who will create a sustainable world - by where we put our cash. You can read more at the SMH website, Industry yet to chase 'ethical consumer' or you can go to the LOHAS website. In an era when everyone wants to seem green, Kyocera is and has been green for years. 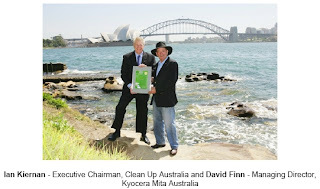 Now Kyocera Mita Australia has been voted by Australia’s IT industry leaders "Green Vendor of the Year" in this year’s prestigious ARN IT Industry Awards and, to accentuate this, Kyocera’s Managing Director David Finn was named ‘Green Crusader of the Year’ in recognition of his commitment to reducing the burden that business activities can place on the environment. Kyocera’s philosophy is to ‘dispose of less, recycle more’ and reduce the impact of business waste on the environment. This philosophy is embraced from the design and creation of the product, its operation with minimal waste and cost, to the biodegradable packaging and the final disposal of their product. Finn is one of the few Managing Directors in the IT industry who assumes stewardship of his company’s products at the end of their life. Kyocera's Environmental Charter dates from 1991 to: ‘contribute to the advancement of society and humankind.’ Sound idealistic? Unreal? Not hard nosed? Well it makes a profit for a US$12 billion (and growing) corporation based in Japan. It looks very much like Mega Planning to me. Imagine the impact if business everywhere took this approach! Well, we're the consumers. Make your choice - buy for the environment! Questionnaires have to be user friendly. You have to be able to read the question and get it 'in one'. People are overloaded with surveys these days, the attitude of may respondents can be "Let's get this done quick". To ensure good information you have to make it easy to respond, short, sharp, clear questions that you can understand at first read. Double barrelled and triple barrelled questions cannot be answered easily. "Develops a plan and follows it to completion" is asking two questions. If the person has a good plan but doesn't follow it, how do I respond? If the person has a poor plan but carries it out diligently, what then? Flaws of this kind are legion in the questionnaires that people devise. Sometimes they are just not obvious at first reading - it depends on the situation of the person who is to respond. Try out the survey and see what people think - is it easy to answer? Does it get you the information you want? Keep it clear and simple, it will gather the information you want, even from the jaded questionnaire filler! We have a great track record in questionnaire development if you want our assistance.